Taco bout a party! From birthday parties to bridal showers and any fiestas in between, everyone loves celebrating with a taco themed twist. The traditional Mexican dish has found an enthusiastic fan base in the U.S. (some more dedicated than others) and spurred a trend in honoring our new favorite food. 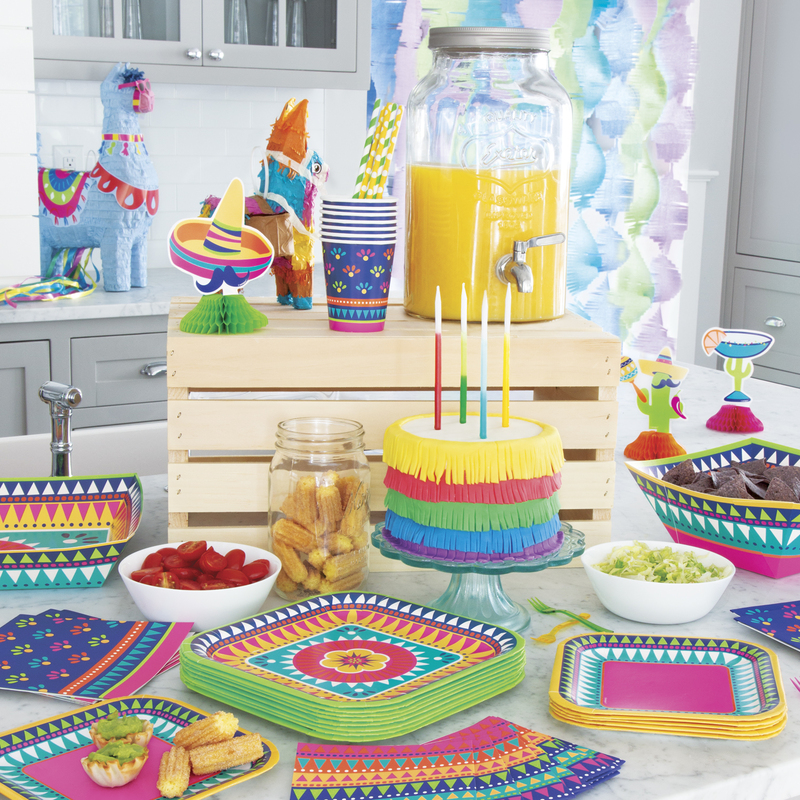 Our Boho Fiesta party supplies are perfect for adding a bit of southwestern flair to the occasion. We couldn’t wait for Cinco de Mayo, so we got our fiesta on a little early and threw our very own taco party. Complete with a DIY taco bar, tequila sampling, and lots of vibrant color, this party was as fun as it was delicious. 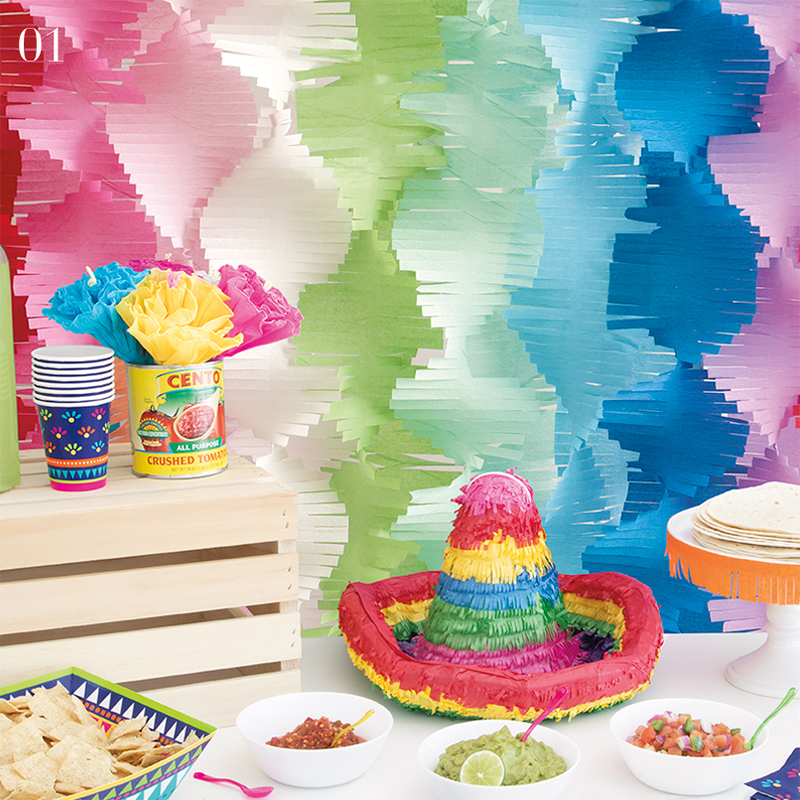 Dig into our favorite taco theme party ideas and Unique Industries’ collection of fiesta party supplies. First, we feast! The pièce de résistance of the taco party is, of course, the build-your-own taco bar. Make sure the buffet is the center of attention by creating a festive backdrop using our Fringe Garland. Simply attach the garlands at the top of the wall and twist. Secure your twisted fringe at the bottom of the wall and slide your buffet table in front. Next, you want to make sure the taco bar is well stocked with tortillas, meat and veggie options, cheese, guacamole, and all the other fixings. We are soft shell super fans, so we displayed our flour tortillas on a cake stand, but hard shell tacos will look just as cute. We used our Boho Fiesta tableware to serve up chips and all our other fiesta favorites. Salt and lime at the ready! What taco fiesta is complete without a shot of tequila or two? Whether your guests are tequila aficionados or first timers, a tequila tasting is a guaranteed hit for this party. Plus it’s super easy to pull off. We salted the rims of our Clear Plastic Shot Glasses and filled them with different types of tequila. Then, we lined them up with the corresponding bottles and made sure to have lime wedges ready. Guests will love sampling this popular Mexican spirit and soaking it up with a second round of tacos. To create the festive fringe around the cake stand, we used our Orange Crepe Streamers. All you have to do is cut your desired length and create the fringe by snipping strips along the length of the crepe paper. It is such an easy craft, and it really makes the table pop! Who said piñatas are just for kids? We decided to put an adult-twist on this classic party game. 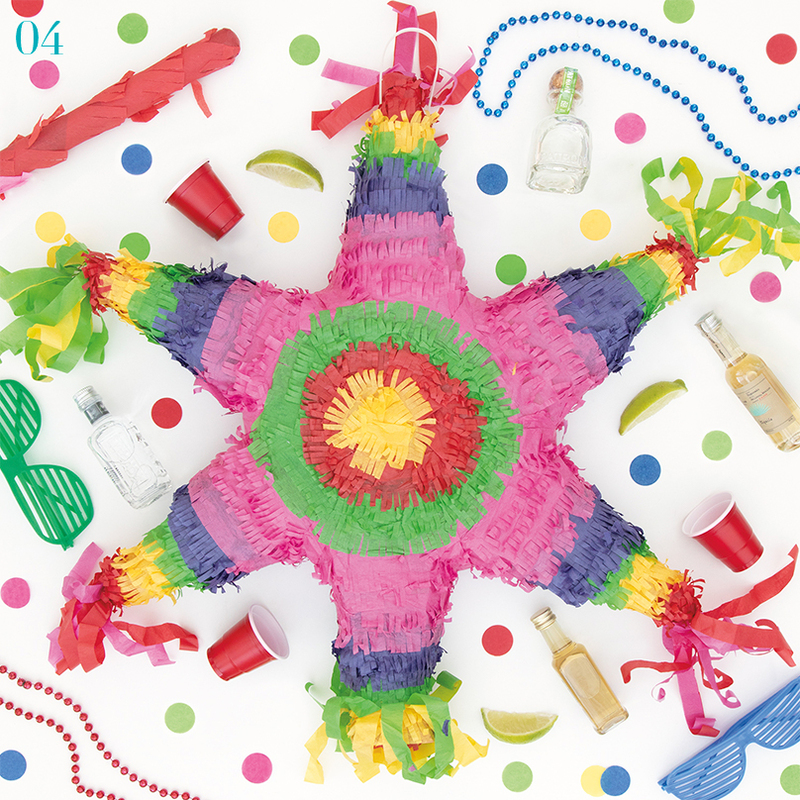 So, instead of sweet treats and disc shooters, we filled our Mexican Star Piñata with mini tequila bottles, party beads, and other small treats. If the tequila tasting didn’t make it difficult enough, you can also use our Piñata Blindfold and Buster to make this game extra challenging. Just be sure you hang the piñata from a sturdy beam or branch, and stay clear of the guest swinging the bat! 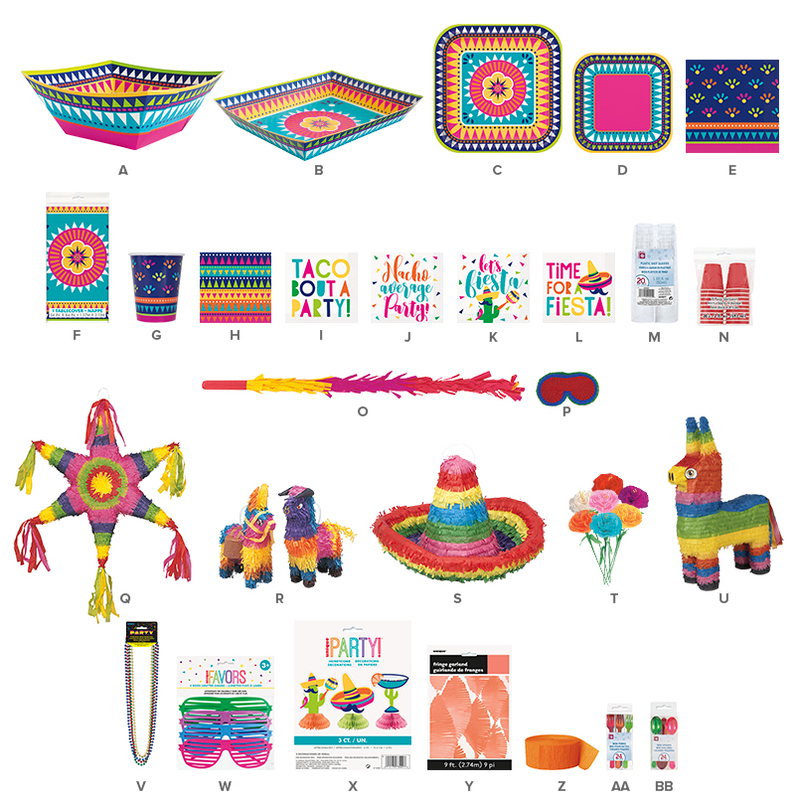 Don’t wait for Taco Tuesday – shop our entire range of Cinco de Mayo and fiesta party supplies today to get ready for when taco and tequila lovers are feeling the heat this summer.